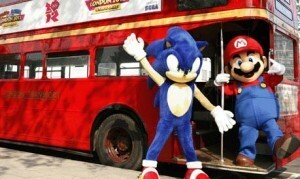 We're not entirely comfortable with the apparent friendship between Mario and Sonic. Once upon a time, they were practically leaders of their respective armies, with playgrounds across the country the battlegrounds, children taking sides in the war of which was better - Sega or Nintendo? Now, they're best buds, taking part in friendly competition against one another in a series of Olympic branded games over the past few years. So it comes as no surprise that a version based around the London 2012 Games is on its way for later this year. If it is anything like the Beijing release, the location of the games is fairly negligible, as the focus is on the various different events on offer, but expect to see a load of red buses, phone booths and shots of Big Ben just to remind you where exactly these fictional characters are supposed to be. Most of the obvious events are set to be represented, such as track and table tennis, but there are some more interesting ones included this time around, like Equestrianism and Judo. We're personally hoping for the addition of Graeco-Roman Wrestling, just for the possible visual of Mario manhandling Sonic in ExCel (this author was Team Nintendo in the playground. Old rivalries die hard). The previous two instalments in 2008 and 2010 were a lot of fun, and this is almost certain to be worth a punt when it materialises in the months around the start of the games. Cost you considerably less than a ticket to the 100m finals, too.